If you’re a fan of walking around your neighborhood and plucking a fruit from a plant to munch on and find coconuts too unwieldy and are too impatient for summer with its mangoes, you are in luck, the Surinam Cherry is fruiting all around South Florida. The berry is very distinctive in that it looks like a bite sized pumpkin. As it ripens the Surinam Cherry goes from green, to yellow, to orange (when it really looks like a pumpkin), to a deep red. The redder it is the sweeter it will be. The riper it is, the easier it will be to pull it from its stem. The Surinam Cherry was originally from South America, but eventually made its way to Miami in the 1930’s. It was grown enough in our region that some people know it as a Florida Cherry. In my South Beach neighborhood they’re all over the place used as hedges to protect the privacy of those living in two story art deco buildings. From late January to May the Surinam Cherries in various forms of ripeness start making their presence known allowing you to grab a handful here and a handful there, leaving a trail of spit out pits along your way. 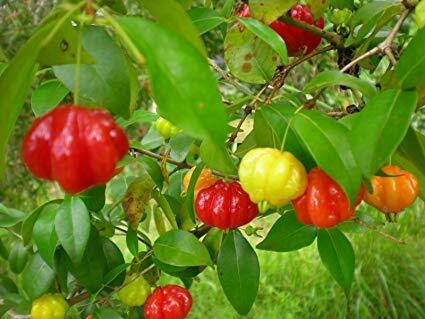 For the health nuts out there, Surinam Cherry is high in Vitamin A and C. And the gourmets out there have made pies, jellies, jams, and pickles out of the fruit. Brazilians were known to ferment its juice into vinegar, wine, and a hard liquor. But for me the pleasure of the Surinam Cherry comes from its ease. Not too many pleasures in life come close to enjoying a low hanging fruit.